With the MAXQDA Web Collector, you can save web pages in your browser and then import them into MAXQDA as a PDF, image or text. Additionally, you can also directly import websites that are available in HTML format as MAXQDA texts. Please note: If you use the direct import of web pages in HTML format, web pages are imported as text documents (and not as web pages). The layout can change a lot during the import, which is why the version of the import with the Web Collector from MAXQDA is clearly preferable. The direct HTML import is particularly suitable for simply structured and laid out data. The MAXQDA Web Collector is an add-on for the Internet browser „Google Chrome“. It allows you to save entire websites and import the files as pdf, picture, or text documents into MAXQDA. Among other things, this tool is useful to compare websites from various organizations, or to collect and edit content from websites for analysis with MAXQDA. Navigate to the website https://chrome.google.com/webstore/detail/web-collector-for-maxqda/jclikkcolnhlpnlcecldfigfdeocdgpf, or search the Chrome Web Store for „Web Collector for MAXQDA“. In order to add the add-on to your browser click „+ Add“. Entire web pages can be saved. The layout remains optimally maintained. Web pages can be saved in a simplified version. The website will be reduced to text and pivotal pictures. Selected segments can be saved in order to transfer only a chosen section of a website. Open the website you want to safe in Google Chrome. When the website is fully loaded open the Web Collector by clicking the tiny MAXQDA icon. Make sure the tab „Web Page“ is open. Note: In case the pictures are not displayed after you switched to the tab “Simplified Web Page” and back, please reload the website in the browser. Assign a name to the document. This name will later be inherited into the MAXQDA project. If required, you can fill in a text in the “Document Memo” box. This text will later be connected to the imported document as a document memo. 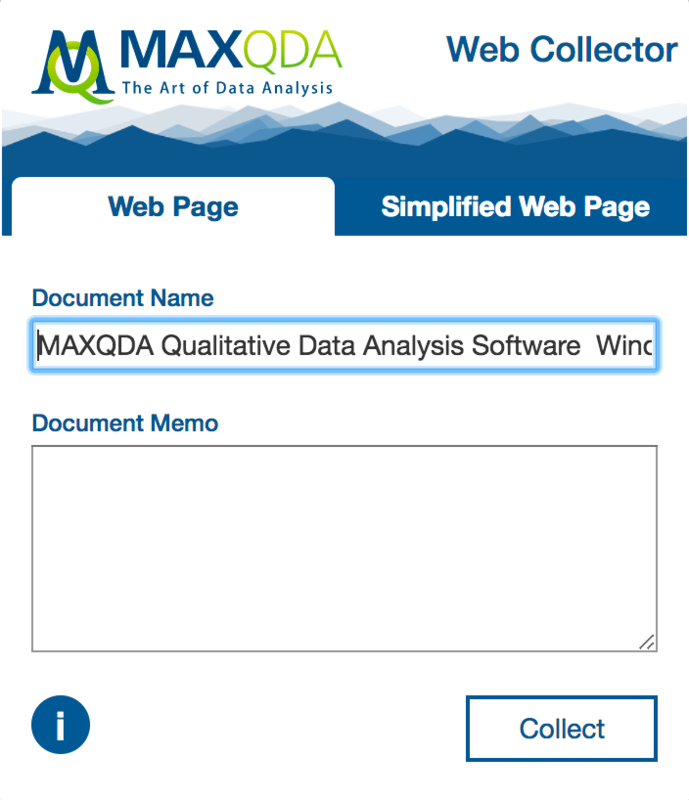 The MAXQDA Web Collector informs you about the progress and saves the website in the selected download folder of your browser. By default, it is the download folder of the logged in user. The web page is saved in a format that was specially developed for a further processing in MAXQDA. Please note: Time for saving can vary depending on the scope and complexity of the website. Websites that are saved this way can be imported into MAXQDA as a pdf or picture document. Click on the “Simplified Web Page“ Tab. The web page will then be displayed in a reduced window. Please note: Some websites cannot be simplified for technical reasons. You will be informed if this is the case via a message in the Web Collector window. If required adjust further options such as font type, font size, and margin. This is particularly important if you want to import the website as a pdf document later. Assign a name to the document. This name will later be inherited in the MAXQDA project. The MAXQDA Web Collector informs you about the progress und saves the website in the selected download folder of your browser. By default, it is download folder of the logged in user. Websites that has been saved this way can be imported into MAXQDA as a pdf or text document. In case you are only interested in a certain segment of a website there is a possibility to save single units of a website. Highlight the segment you are interested in with your mouse. Right-click the highlighted segment and choose Collect selection. The highlighted segment will be downloaded immediately. It will be saved in your selected download folder. Segments that have been saved this way can be imported into MAXQDA as a pdf or text document. Copyright notice: the MAXQDA Web Collector uses “Single File”, a Chrome extension created by Gildas Lormeau. Open the MAXQDA project you want to import the saved websites in. Mark a document group in the “list of documents” in order to import the website in a selected document group. Select Documents > Import web pages from MAXQDA Web Collector in the main menu. If you open the dialog for the first time MAXQDA selects the standard folder for downloads and displays it at the top of the box. Every single website located in this folder will be listed in the center of the dialog. By clicking the three dots … you can choose any other folder to import saved websites from the MAXQDA Web Collector. Select every website you want to import with the mouse. It will be highlighted green. Tip: Double click a row to open the downloaded file in the Internet browser. This allows you to check single websites for their content. Two options are provided at the bottom of the dialog: first, you can select whether websites should be imported as pdf or picture documents. Second, you can select whether simplified websites or segments should be imported as pdf or text documents. In order to start the import, click Import selected files. The time for import can vary depending on the scope and format of the selected document. A progress bar informs you about the import progress of each document. In case you selected pdf or picture format and you want to import big files, MAXQDA asks you whether you want to import them as externally saved files or in the project (see External Files). Please note: The main layout will be adopted in the import process. The website’s changed print layout won’t be intentionally not imported. Deviations from the website’s original layout might occur especially as far as complex websites are concerned. You can also import an HTML file directly into MAXQDA. To do this, go to the Import tab and select In the dialog box that appears, select the HTML file. MAXQDA imports the file as a text document and includes images, if they were linked correctly in the HTML file.